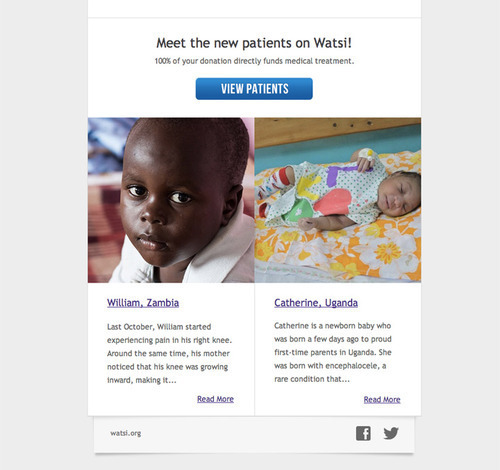 At Watsi, we’re just starting to get our feet wet with email marketing. And unlike other organizations, we don’t have any strategy to speak of. Instead of debating internally about our content and approach (e.g. a weekly digest vs. a monthly newsletter), we’re going to assume nothing, fearlessly test everything, and see what works. Whenever we discover something that we think is interesting, we’ll post about it here. Email B, which included the patient profiles, saw a 35% increase in clickthroughs and a jaw-dropping 126% increase in conversions (i.e. donations made on Watsi). Apparently, people really like faces and stories, and as a result, you’ll see a lot more of them in our future emails.